Emily Brontë will be one of the authors of works available from Spoken Network audiobooks. Emily Brontë's favourite flower, the bluebell, is under threat of hybridisation with commercial and Spanish varieties of the flower. By 15, I had already penned an 800-page tome of Bronte-esque proportions, and I don’t mean that in a good way. It smacked of Jackie Collins and Danielle Steele, although I hadn’t (and still haven’t, to this day) ever read a word they‘d written. Jane Eyre is part of the 'essentials of British and World literature' in new school textbooks. And Humboldt Light Opera Company's production of Jane Eyre: The Musical is reviewed here. Possibly the production doesn't work entirely on a small stage? Although “Jane Eyre” may not translate well from 19th century gothic novel to 21st century musical production — at least, not on the small stage — Humboldt Light Opera Company continues its tradition of not settling for the easy out. They continue to take on challenges and provide pleasurable and entertaining theater-going experiences for the North Coast. Thanks again to Thisbeciel, here are two clips from promotions for Jane Eyre: The Musical. One is the performance of the song 'Secret Soul' from the Rosie O'Donnel show, and the other is a performance of the same song from Bway on Bway. Enjoy! Brontëana reader, Rinabeana, has taken the time to write her impressions of the production now playing in Irving Texas (details here). This is a long excerpt from her review at the League of the Extraordinarily Rochester Obsessed, which explains some of the short cuts here. If possible I will post the rest in a convenient way. 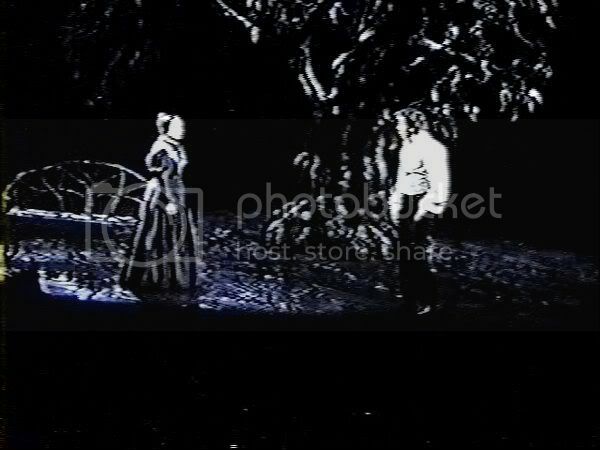 The prelude is a backlit stage with Rochester calling Jane, Jane, Jane across the moors. I was about to have a heart attack thirty seconds into the show I was so excited! The basic set was a large ramp platform, with additional ramps leading to each side of the stage. The large central ramp was tilted to the side so one side of the front end had a step and the other went down to the stage. They lowered windows and doors and moved furniture often to set the different scenes. It was fairly sparse, but you could definitely get the idea. If I recall correctly, the original production had a giant circular rotating stage, but that was definitely not the case here. Much lower budget, I imagine. I don't know how many of you have seen the show, but I was absolutely SHOCKED at how much music was not included in the original cast recording. I'd say that at least half of the songs were new to me. I marked all the new material with stars on the program (which I scanned and included below) and it's a lot! Plus, there is quite a bit of dialogue without music. I was overjoyed that much of that was straight out of the text! Imagine my glee when Rochester referred to Jane's "fairy ring" and the "men in green"! Pretty much all of Mrs. Fairfax's additional songs were to the tunes of Perfectly Nice and Slip of a Girl. In fact, I didn't hear a lot of new music, just lots of new lyrics. They definitely put the most important songs on the original cast recording. WHY COULDN'T THEY INCLUDE IT ALL, THOUGH??? I was sold at the scene after Hay Lane when Rochester sings Captive Bird while inspecting Jane (by sort of gimping around her) and it was positively smoldering! WHEW! Also, if you aren't familiar with the story (which doesn't apply to anyone here of course), it's quite choppy to go from Perfectly Nice to As Good As You. I love the in between stuff! I think one of my favorite parts with Jane is definitely Painting Her Portrait. I know this is a community for the Rochester love, and I do like his and his and Jane's songs the best, but I still adore Jane. Painting Her Portrait so perfectly encapsulates her passion and inner turmoil. It's perfect that no one else is involved in the scene at all because she rarely lets anyone else see her emotion. The actress did a great job fiercely drawing and then tearing the pictures when she was done. My poor Jane! The Gypsy scene cracked me up! I definitely got a feel for how it would be staged from listening to the original cast recording, but it's so fun to see Rochester in his woolen shawl and floppy hat mocking all the snippy girls! They certainly played up their parts, huffing away when he insulted them. Blanche nearly had a temper tantrum, which was fabulous! And who couldn't love the part when he reveals his identity to Jane? I did think it kind of went too far when he asked her how Blanche reacted and Jane told him that she flounced off looking upset. Our smart Jane would have realized that he was playing a trick on her and not been quite so incredulous at the proposal. It was funny, though. I already mentioned the St. John part, but I can't stress enough how much I disliked the set-up. That's really my only major complaint with the show. Jane NEVER fell for him and he certainly didn't love her! The implication was that she had given up on Edward and was all set to go to India as a wife. There was no psychological manipulation and then the twit tells her she's formed for labour and everyone is on to his game. I think that's why everyone laughed, since the set-up was so incongruous with the denouement in that scene. Of course everyone was rooting for Rochester, even if they didn't know the story! The Voice Across the Moors always gives me chills anyway. I wanted to shove St. John off the stage because he's so extraneous there! HEE! The return to Thornfield was amazing. After Fairfax explained what had happened, Robert helped the blind (and disfigured!) Rochester to a little bench. That nearly broke my heart. Though Jane didn't sit on his lap (pooh!) the chemistry between them in this scene was wonderful! I totally lost it when Rochester sang to the baby, too! Of course, after that the baby got whisked off stage (through Jane, then Adele, then the maid/nurse) right quick! If it wasn't for Jane's ridiculous huge puffy sleeved dress, that scene would have been perfect! From the program it also looks like severals songs were renamed. 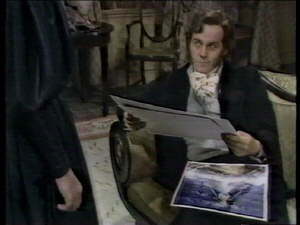 Before Jane leaves Thornfield, the song 'Sirens reprise' has been renamed 'Sail Away' which sounds like an '80's pop tune… Other items from the review: the audience appears to be aware of Bertha before Jane is. The audience sees Bertha attack her brother, but it is the butler not Jane who tends Mr Mason. There was also an unwise blending of the characters of Miss Scatcherd and Miss Temple- not a doubling, a blending, and St.John was unappealing but vaguely a love-interest (which disturbs this fan and others in the audience who burst out laughing at him). ETA: Ah, also, Rinabeana reports that Mr Rochester (Greg Dulcie) is 'a giant bear of a man', at least a foot and a half taller than Jane. From the program I see that he indeed has played Goliath in a play King David. His credits also include: "costarred with a streaking sheep in the number one ranked Super Bowl commercial for Budweiser." Did he tackle it? In the history of a musical, one can never be sure what will come to the surface and when. Yesterday a 14 minute fragment of footage from the Gordon/Caird Jane Eyre: The Musical came to light, out of the depths of fandom where it had been cherished for several years. Only 14 minutes of the production at La Jolla. this production lies at the centre of the massive reconception of the work, when it transformed from 'musicalised BBC drama' to 'Cliff Notes Jane Eyre.' It is peculiar, and any new material is something special. I do have a full audio recording of the work, but it leaves me with more questions than answers. This clip includes the Gypsy scene and the proposal. The quality is rather poor but good enough to show some of the staging- the elusive chestnut tree for example. Unfortunately the clip cuts off abruptly before the moment the tree is struck- which is something of a mystery to me; how it was done. I asked the composer, Paul Gordon, about this once. He recalled that there were in fact two trees. That they were rapidly switched and that it was 'very noisey'. The tree was so noisey that it 'not infrequently set off the fire alarms' and the theatre would have to be evacuated! Somewhat too realistic, perhaps! I think the technical demands of using this effect in turn had an effect on the music. There is a strange bit of music during the La Jolla proposal scene which fans of it have mockingly dubbed 'Rochester Triumphant.' Now, the recording is made from the sound board so the effects are always louder and more obnoxious than they would be in the theatre, but 'Rochester Triumphant' features trumpet fanfares and other effects culminating in a shout of exhaultation from Mr Rochester followed by bells and a choir. It is awful, doesn't appear before or after this stage in the show's development. And I think it is all to cover up the noise of the tree. but there is peace, I have my Jane! 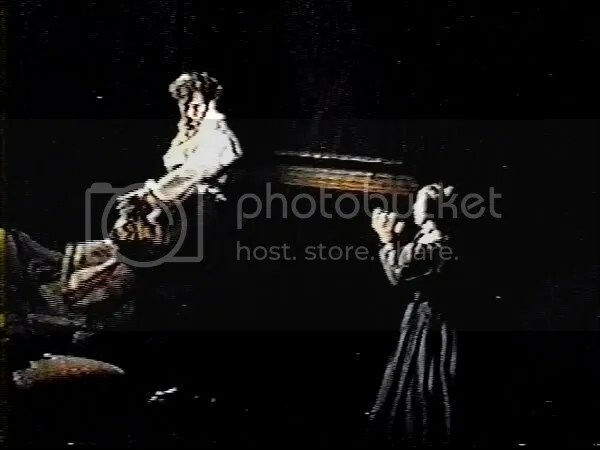 This last image is from the gypsy scene and apparently shows Mr Rochester doing his impression of a matador (just to show off his acting ability, of course! His hair is also notorious in this production. It is quite a hideous Zamorna wig) and there's Jane encouraging this sort of behaviour. The book of this musical was written by John Caird, co-director/adapter of the Broadway smash LES MISERABLES. Lyric Stage's Founding Producer Steven Jones first saw JANE EYRE during its Toronto run in 1996. “I loved it. I was in Toronto to see the pre-Broadway engagements of RAGTIME and JANE EYRE. I saw JANE EYRE the first night and RAGTIME the following afternoon. I was so moved by JANE EYRE that I returned to the Royal Alexandra Theatre to see it a second time.” After sold out runs in Toronto and at the La Jolla Playhouse, JANE EYRE opened at Broadway’s Brooks Atkinson Theatre on December 10, 2000 and was nominated for 5 Tony Awards. Lyric Stage’s production will be only the third professional production since its Broadway engagement. It is nice to know that others besides myself still admire that early version of the show! Performances dates for JANE EYRE are April 28, 29, May 4, 5, 6, 11, 12 & 13 @ 8:00 PM and April 30, May 7 & 13 @ 2:30 PM. Tickets are $24-$30, with discounts available for students and groups, and are available by calling the box office at 972-252-2787 or CLICK HERE TO ORDER ONLINE. All performances are in the Irving Arts Center’s Dupree Theater, 3333 N. MacArthur Blvd. Irving, Texas, 75062. Thanks to Agnes and Mrs. Dionysius O'Gall, for the news and the link. ‘My name is Jane Eyre. My story begins, gentle audience, a long age ago, in the dark and lonely attic of Gateshead Hall…’The famous story of Jane Eyre makes for a dramatic storyline in this gripping new musical. This haunting adaptation of Charlotte Brontë’s novel opened in 2000 on Broadway, to rave reviews. Composer Paul Gordon (who wrote for artists such as Bette Midler, Smokey Robinson and Quincy Jones) creates a sumptuous listening experience, especially for its memorable melodies and lyrics. The show’s creators come closer than anyone could have imagined to capturing the spirit – and spirituality – of this dark, Cinderella-like story. The novel tells of a plain, feisty orphan in the Yorkshire Moors, surviving an horrific childhood to become governess and, ultimately mistress of Thornfield Hall, owned by the mysterious Rochester. They are all threatened by destruction, by a dark secret hidden in the attic. Premier Theatre Company, famous for Chess, Mack & Mabel and Ragtime The Musical, return to the Grand, to offer patrons another opportunity to witness a ‘premiere’. No concessions on Tuesday evening or any Saturday performances. *This is not, in fact, the British premiere of Jane Eyre: The Musical. The show premiered in the UK last August, according to Bronteana archives. Firstly, long-time readers will notice a slight change to the Brontëana layout. I have been trying to find an efficient way to organise the archives for some time and have finally met with some limited success. This is only a start, but now for the first time you can search the archives from the bottom of the sidebar under 'Brontëana Index'. So far I have only indexed the primary works of the Brontës and the immediate family members themselves- although the archives contain information about the extended family as well. All of that and more will be more readily available in time. But it is a step in the right direction! Check back soon, I intend to keep working on it over the week. Humph! Not that I mean to demean Miss Austen and her works… But humph! all the same! And thirdly, I don't know what to make of the Mystery of Irma Vep either! The Mystery of Irma Vep finds two actors performing eight sizable roles in a tale that's a wildly improbable mix of melodramatic literature and film, from Wuthering Heights to The Wolf Man, The Mummy and vampire legends. This found me by way of Thisbeciel and Biedroneczka. This is yet another musical. Most of the tracks can be downloaded from Mr.Taylor's website, but there is also a CD which I think includes another 15 songs. I am hoping to coax someone into writing a review for Bronteana. For now, I have some initial reactions to register. Taylor's musical was the first stage adaptation of the story to be given the approval of the Brontë Society. The concept album was released by Silva Screen records in 1992, and opera star Lesley Garrett also used two of the songs for one of her best-selling solo albums.A 1994 amateur performance in the Netherlands was very successful and generated discussions for possible other productions. It has been running in repertoire in Poland since 1996 and Rumania since 1997. It debuted in Australia in 1998. This is the second music theatre adaptation of Wuthering Heights that I have come in contact with. I thought, and still do think, that the novel has a lot of potential for both opera and music theatre. Both of these work best when the emotions stretch beyond the imaginative levels of experience to the mythic. This is why characters in music theatre break into song. But the first version of Wuthering Heights that I heard so failed to reflect the mythic level of WH that it left the whole thing as something of a farce. Heathcliff was far too vulnerable and …well, nice. The music was melodious but lacked depth. I should return to it, because I have only heard some very small selections but these impressions have stuck over repetitions.This production from 1990 is a different story. I am quite impressed with the sensitivity of the score in particular. On the first listen, I was troubled by some of the lyrics but even then I realised that I was simply biased against the very idea of Heathcliff singing. When I got passed that, on a second and third listen, I heard the Arabic rhythms of his theme. I came to think that IF Heathcliff were to sing, he would sing like this. The exclaimations of 'Cathy!' that troubled me before now seem to rumble in the underscore and force their way through into the melody. Besides this, the songs are beautiful in their own right. In the Prelude there is beauty and a sadness lurking behind it. I get the impression of beginning a celebration and a tragedy. I think this is fitting. Two of the songs I've gone over are: Cathy! and I See a Change in You. In addition to Wuthering Heights, Mr Taylor has adapted several other works of literature to music theatre- with equal sensitivity! 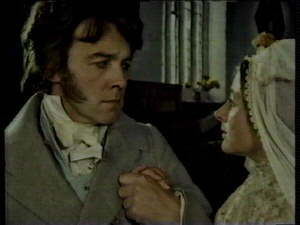 He has adapted Pride and Prejudice, which captures the period so nicely in its score. The lyrics also are quite good but there's something… off. I think it is his weakest adaptation of those I have listened to so far. He has also adapted Much Ado About Nothing, which I have to admit is delightful. Again, he has managed to encorporate the scales and rhythms popular in the Renaissance into this work. I will take the liberty of recomending Benedick's song on hearing of Beatrice's passion: Madness, performed by Paul McGann as Benedick. The work has also been the subject of discussion in the journal formerly known as 'Bronte Society Transactions' but now known as 'Bronte Studies.' Mark Seaward, editor of B.S.T. said of the work: "Bernard J. Taylor’s work marks the first time that the true spirit and drama of Emily Brontë’s masterpiece has been captured in a musical." Taken from this page, also on Mr.Taylor's site. "Bernard J. Taylor's big, sweepingly romantic score sustains a feeling of dark passion entirely appropriate for an adaptation of Emily Bronte's novel concerning the ill-fated love between Cathy and Heathcliff." – Show Music Magazine, USA, Summer, 1992. "This is what stage music should be – passionate, powerful, melodic . . . If you buy only one album this year, make it this one – Mike Gibb, Masquerade Magazine. "Every number, whether vocal or instrumental, packs the kind of emotional punch that musical performers and audiences cry out for." – Sarah Hopkins, Beneath the Mask, Summer 1994 issue. "Something to shiver about!" – House & Garden (British edition), March 1992.